There is no specific website that is prone or vulnerable to malware attacks. It can be surprising to see the most common eCommerce website to be infected with malware lurking from behind. Recent reports, reveal that close to 75% of the genuine websites are vulnerable to malware infection. Hackers introduce malware into the website to infect both the website and its visitors. The modus operandi would vary based on the type of infection while the purpose of the infection would be the same. Hackers develop malware, defined to lurk around the PHP files, HTML files, database and there are many other areas too. If you feel, cybercriminals are trying to tamper your website, nothing to worry, there are ways to know if your website is infected with malware. Website Scanning is one of the most common ways to identify the existence of malware on your website. This is the first line of website protection. Security experts have developed website scanners to instantly check files within the website for backdoor files, malware scripts, malicious code and algorithms. Once the malware is identified a notification is sent to the users. Malware can be identified manually by reviewing the source code of the infected website. If you find any suspicious file after in the website source code then you can confirm that there is a malware. It is not just about identifying the malware, its more about understanding the techniques and methods on how to remove the malicious code from the infected/hacked website. Website scanner does not just performing website scanning of malware, but some are developed to remove the malware as well. However there are website scanners that can only identify malware and are deprived from removing them. Considering this, as security experts, you should be equipped with ideas and techniques to manually download the website and search files and have a check to identify malicious code. Once identified, it has to be manually removed and then replace the clean version on the server. Comodo Web Inspector Tool is a good tool that assures Malware Removal. It also helps to Repair any Hacked Website. 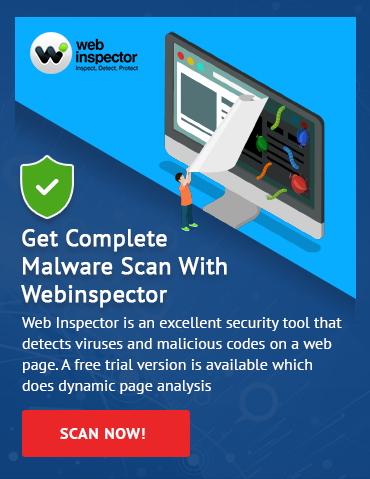 Comodo Web Inspector utilizes advanced , cloud-based malware scanning technology for website scanning and checks for viruses and malware infection. It detects security holes and vulnerabilities, and safeguards websites against security threats. Web Inspector also monitors website blacklisting and warns website owners before websites get blacklisted. Daily Malware Scanning – Web Inspector performs daily malware scanning to check for viruses or malware infections. You will be notified immediately when a problem is discovered. Blacklist Monitoring – Web Inspector also helps you check your online reputation by performing an exhaustive blacklist monitoring check to ensure your website is not blacklisted by major search engines like Google and Yahoo. You will be notified immediately if you’ve been blacklisted. Immediate Notifications – Be it malware or any other vulnerability detection or blacklisting, you will receive immediate notification via mail from Web Inspector. Critical notifications which can help you keep your website safe. PCI Compliance Scanning – Web Inspector also incorporates a full-fledged PCI Scan Compliance solution powered by HackerGuardian. This will enable you to understand the extent to which your business website complies with PCI standards (extremely crucial for online merchants). (Not available with the basic version*). Trust Seal & Customer Support – You’ll also get a Web Inspector Scan trust seal using which you can visually communicate to your customers that your website is safe, secure, verified and can be trusted. This will give them the confidence to revisit your website. Then there’s the 24/7 customer support as well. (Both of these features are not available with the basic version*).